Inmate Daniel Thomas records a video from Joseph Hart Correctional Center in Lexington that will be sent to his 14-year-old son as an early Christmas present. It’s a rare occasion when Daniel Thomas is able to speak with, much less see, his 14-year-old son Carson. Arranging a visit at the Joseph Harp Correctional Center in Lexington, where Thomas is serving a 20-year prison sentence, is difficult because of visitation policies, scheduling issues and the three-hour round trip to and from the prison. Even talking over the phone can be prohibitive, with each 15-minute call costing inmates $3 or more. So Thomas, 32, knew he’d need to choose his words carefully as he spoke into the camera that was set up in a small storage closet of the medium-security prison. The video was shot by a nonprofit organization called OK Messages Project. The group visits prisons throughout the state so parents can record videos of them reading books or just talking to their kids. It is one of many private groups working to reach children of incarcerated parents by helping to ensure the children can connect to them while they are behind bars or finding them role models elsewhere. They warn this population is at risk of repeating the mistakes of their parents or having other problems later in life unless the state, along with other groups, invests the time and money to ensure they are not forgotten. 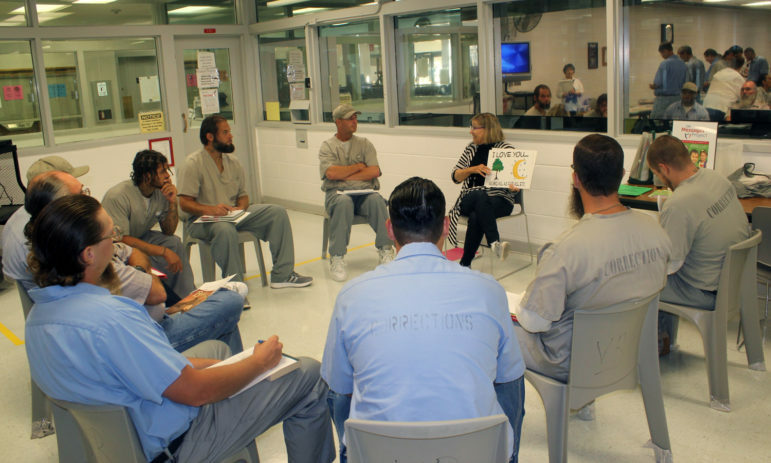 Cheri Fuller, executive director of OK Messages Project, gives tips to inmates at Joseph Hart Correctional Center in Lexington before they record videos to send to their children. Although no hard numbers exist, a recent national report estimated that 96,000 children in Oklahoma have had a parent in jail at some point in their childhood. Sharp began researching the impact of incarceration on inmates’ children more than a decade ago. She discovered they were at more risk than other children of having problems in school, abusing alcohol or drugs, or engaging in criminal activity One study she led found that 45 percent of children experienced mental health problems following a mother’s incarceration. Cheri Fuller founded the OK Messages Project in 2008 after becoming aware of the problems children experience following their parents’ incarceration. She said allowing kids to watch the videos their parents record from prison can help alleviate their anxiety or sense of detachment from their mom or dad. Sharp’s research also found that children who maintained contact with their parents during their time in prison faced fewer problems than others. Sharp’s findings – and the fact that Oklahoma routinely leads the nation in the rate of women sent to prison – led the Legislature in 2011 to create the group that eventually would become incarcerated parents advisory committee. The group determined that only about 10 percent of the state’s children of incarcerated parents are in the foster-care system. The rest live with their other parent, extended families or family friends. The committee’s 2016 report to the Legislature found that there was no data available to determine how many children got to visit their parents or pursue reunification. Sharp said collecting that kind of data is difficult. Because of privacy issues, no state agency compiles a “master list” of children of incarcerated parents. Because of budget woes, the Oklahoma Department of Human Services announced in August that it was ending its contract for the 17-year-old Oklahoma Marriage Initiative. The state had spent more than $70 million in federal funds on the program, which was mainly aimed at cutting the state’s high divorce rates. But a little-publicized offshoot of the program, called the Prevention and Relationship Enhancement Program, was also used to provide curriculum and train corrections staff to offer workshops on parent-child relationships and family issues to thousands of inmates. Leo Brown, the Corrections Department’s agency chaplain and volunteer coordinator, said the PREP program was valuable. Although some trained chaplains will still be able to offer workshops, the program is largely on hold as the department looks for volunteers or private-sector partnerships to resume it. The Corrections Department is one of the state’s most cash-strapped agencies. It has requested $1.65 billion – an increase of $1.16 billion over its current funding – for next year’s budget. Most of the new funds would go to staff raises and infrastructure projects. That means approving other initiatives that have even modest costs face steep odds. One such request is to set up a “video visitations” system that would allow families to chat via computer screens, something that advocates and inmates have requested for years. April Sellers White, a former judge and the other co-chairwoman of the incarcerated parents advisory committee, said even smaller steps, such as charging less for phone calls or providing envelopes and stamps so inmates can send letters, could make a difference. On a grander scale, White and Sharp said the state needs to continue looking at more intelligent sentencing policies to ensure that people kept in prison really need to be there. If imprisonment is the best option, White said, the state should be responsible for rehabilitating inmates so they can become productive citizens – and parents – when they are released. That includes providing adequate substance-abuse and mental-health care, services that have also been curtailed by state budget cuts, in and outside of prison system, White said. Several non-government organizations are doing what they can to help. This year, Big Brothers and Big Sisters of Oklahoma paired about 500 children of incarcerated parents with a mentor through its Amachi Program. Darrell Weaver, CEO of the statewide program, said he was proud that the group has been able to connect so many children with role models. He said he has seen convincing evidence that they are less likely to turn to drugs or a life of crime. Weaver’s group is one of many nonprofits or faith-based organizations that are tackling the issue. Others include Little Light Christian School, a tuition-free elementary school in Edmond for kids of incarcerated parents; Girl Scouts of Eastern Oklahoma; the Salvation Army’s Angle Tree program, and Tulsa-based New Hope. Corrections Department Chaplain Brown said the impact these groups are making is substantial. “They are our safety net at this point,” Brown said. Like Weaver, representatives of several groups said they, too, were facing their own budget pressures. Jennifer Davis is the executive director of New Hope, which offers after-school programs, a summer camp, retreats and other services for children of incarcerated parents. Davis said the group had been able to expand modestly to serve more children from across the state in recent years. But since New Hope relies on private grants and donations, the breadth of its work is still limited, she said. The story is much the same at OK Messages Project. 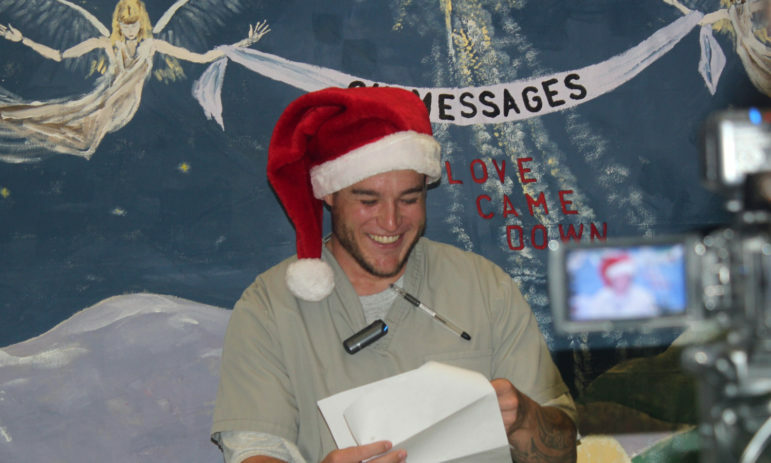 For Thomas, the Joseph Harp inmate, that meant he could take time this holiday season to read from a book of quotes to his son Carson, share some fatherly advice and even remind him that he could sell the pecans from the tree outside his grandfather’s home. It also meant he could say some things that he might have trouble saying to his son during one of their rare in-person visits. Guthrie resident Kim Watson overcomes the physical and emotional challenges of parenting with a disability.